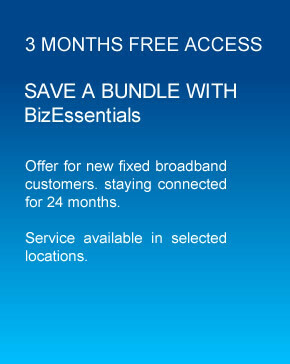 Telstra BizEssentials® is a cost-effective business bundle that combines your business broadband and fixed phone into one package, so you can get on with the job. 1.This offer commences on 21 July 2015 and ends on 30 September 2015, unless otherwise advised by us. b.you recontract an existing BizEssentials Telstra Businesss Plan and are specifically invited by us to participate in this offer, we will waive the normal minimum monthly charge for your BizEssentials Telstra Businesss Plan for the first three months of your plan (Offer). You must pay all usage charges during that time. 3.If your BizEssentials Telstra Business Plan (or a service forming part of that plan) is cancelled or transferred to a third party you are no longer eligible for the Offer and the new BizEssentials Telstra Businesss Plan holder is also not eligible for the Offer. 4.The Offer is not transferable and cannot be redeemed for cash. 5.The Offer is not compatible with other offers, including other Telstra BizEssentials offers, unless specified by us. 6.These terms must be read together with the terms and conditions of your BizEssentials Telstra Businesss Plan. To the extent of any inconsistency, these terms prevail.